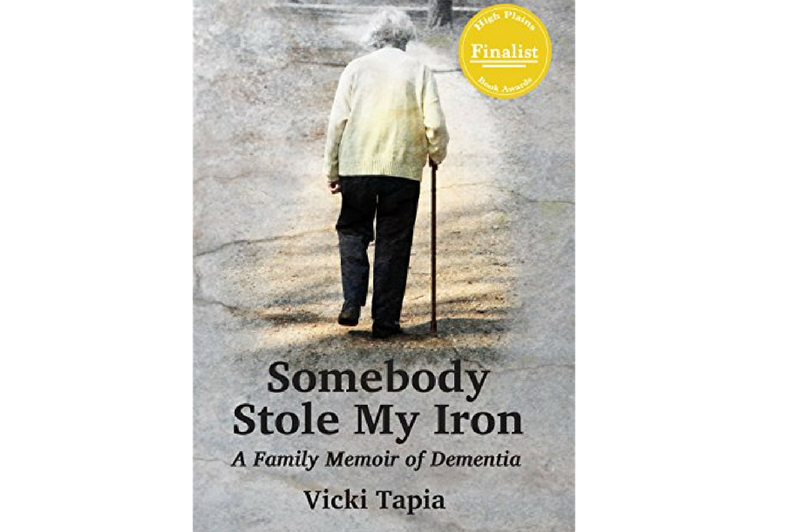 Home » Blog » Alzheimer's » A Review of Who Stole My Iron: A Family Memoir of Dementia by Vicky Tapia & You Could Own Your Very Own Copy! Those words hit a chord in me that I couldn’t quite shake for a day or two. It made me think that about how dementia is the sibling that we never wanted. The Uncle who drinks to much wine and then argues with everyone at the Thanksgiving table. Or the great aunt who lives with thirty-seven cats and has breath like a can of sardines. I have to be honest, I haven’t completely finished this book yet. It’s definitely not for lack of trying. Every time I’ve sat down to read I’ve been interrupted either by hubby, mom, or the phone (that means you daughter). It all started with a tweet. The author Vicky Tapia sent me a Tweet about her new book Somebody Stole My Iron and I clicked on the link. I don’t often read books about being an Alzheimer’s Caregiver because when you are living it day in and day out you rarely want to spend any respite time reading about it. This one was different after reading “Somebody Stole My Iron began as a diary to help her cope but emerged as a road map for others.” I mean that’s exactly how TDAC got started. So I bought it and at only $2.99 it was a steal. I’ve gotten pretty far in this 346-page book and I plan to finish it up tonight. The one thing that I liked immediately is how much the author and I had in common. The ways in which she describes her mother’s personality and quirks the more it sounded like my own momma. She has never been a happy person and it can wear you down sometimes. She is one of those true Southern women who suffer through everything and make sure that you are gratefully aware of it. She’s never been a warm cuddly mother, but she has always done her best. The second thing that I liked, was her talent for painting a picture with her words that make you feel as if you were peeking through the kitchen window. She has a way of saying things that, if you are or have been a caregiver, will have you nodding your head in full agreement and others will have you laughing out loud. The fact that she is brutally honest and doesn’t try to sell you the “everything is perfect” story made me like her instantly. I’m all for positivity, but you have to keep it real and she does. I think that you will really enjoy her experiences and her storytelling and you can find yourself! Vicky has graciously offered to provide one lucky winner with their very own copy! In the comments below tell me about your funniest caregiving moment. If you’re not a caregiver and still want the book just tell me something funny that happened to you lately! You have until midnight on Sunday 2/19/17 and I will announce the winner right here on Monday morning! Now, I’m off to finish my book! *I’m really not sure if this is considered a sponsored post. I purchased my own copy, but she will be providing the winner’s copy. What you like about this book is the same thing I like about you. You are a happy and upbeat person, but you don’t sugar coat the toll this disease takes on both those who have it and those who love and take care of the people with it. Sounds like a must-read for all caregivers! Something you could have written, Rena! Excellent, helpful guide for those in similar situations as you, Rena. I seriously think that you too, should consider writing a book about your experience. It would help so many people! Sounds like a great book, Rena. Don’t put me in the running for the contest because I have so many other books to read but if I were a caregiver it’d be right up my alley. I’m so glad you are enjoying reading it and it’s given you some relief to know another person who has things in common with your difficult experience. Hugs. How far we have come since the early days when Alzheimer’s was a confusing diagnosis and victims suffered needlessly and caretakers were terrified. Actually, in typing that last sentence, it’s pretty obvious that we haven’t come far enough, have we. Nevertheless, I applaud all literature that seeks to illuminate the experience and ease the pain of those who feel alone.